There are two great art happenings tonight, and it’s killing me that I can’t attend both. 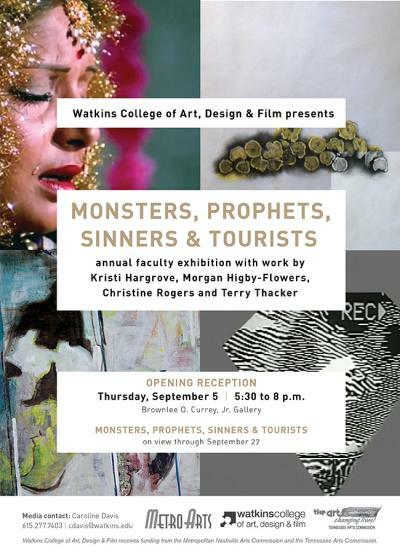 The first is a Watkins opening reception for two of its new faculty members, Fine Art chair Kristi Hargrove and Fine Art assistant professor Morgan Higby-Flowers. The show “Monsters, Prophets, Sinners & Tourists” is open tonight from 5:30pm to 8pm. As a part of the Clarksville First Thursday Downtown Art Walk, Austin Peay professor Josh Gumiela is presenting a NO MEDIA event. Participating artists are randomly matched in sets of 3 && given 10mins to perform. NO MEDIA aims to bring together artists from a broad range of performable disciplines (poets + dancers + expanded cinemaistas + free jazzers + audio/video noise makers + etc) to challenge the conventions of their practice by responding in realtime to artists from other disciplines. No Media At The Beginning! No Media At The End! Today Josh sent out the final details for the show, which I am including below. He’s appeared on several Theatre Intangible episodes and has exhibited work at Future Night, The Circuit Benders’ Ball, and the Wedgewood/Houston ON/OFF exhibit. I’ll be performing at tonight’s NO MEDIA event, armed with an SK-1 keyboard. It should be a blast! Please arrive by 6pm in order to be entered into the pool of performers. There will be a PA, mixer, and one video projector available. We will also have power outlets available near the performance area. That’s it. Bring all cables/wires/misc. tech required for your performance. You! And anyone else you can bring along to participate. We need as many performers as possible in order for this to be a success. Absolutely anyone is welcome. This is a safe place to take risks and experiment. No documentation is allowed so there’s no worry that your performance will be captured on YouTube or Facebook for all of eternity. Assume that most, if not all of us, will fail in epic fashion. And that’s totally okay. Actually, it’s kinda the point.